Those of you who know me are aware of how much I love french fries! I confess, I love salt and I’ll choose a bag of chips over a chocolate dessert any day. That definitely means I’m a big fan of poutine. It’s not usually something I make at home, but I’ve been rethinking poutine for a while now. Yes, I know, poutine is certainly not a typical Italian or Sicilian recipe. But this dish has been such a big hit in our home that I couldn’t resist sharing it with all of you! This recipe for Plantain Poutine was a collaboration with my husband. 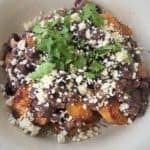 We enjoy Latin American cooking and during a recent conversation, I was wondering how we could come up with a variation on poutine with Latin American flavors. You can see what a serious conversation this was! We were inspired by a dish called “cassado” we enjoyed almost every day during a trip to Costa Rica: black beans with rice, plantain and grilled fish. We could live on black beans and rice! about time you did! No, they are not bananas, in fact they are eaten as a vegetable and must be cooked. Of course, they are best fried but I baked them until crisp for this recipe and they really work. This is what my plantains looked like at the time I made this poutine: yellow with brown spots beginning to form. The more they brown, the sweeter they taste. We then decided to replace the traditional gravy served over poutine with a creamy black bean sauce. Finally, you can serve with the usual squeaky cheese curds or, if you want to stick with the Latin American theme, crumble some questo fresco over the dish. Whichever you decide, plantain poutine is definitely a keeper! If you try out this recipe, please let me know by tagging me with #mangiabedda on Instagram. My husband and I created this alternative to traditional Quebec poutine and has long since become a family favourite. 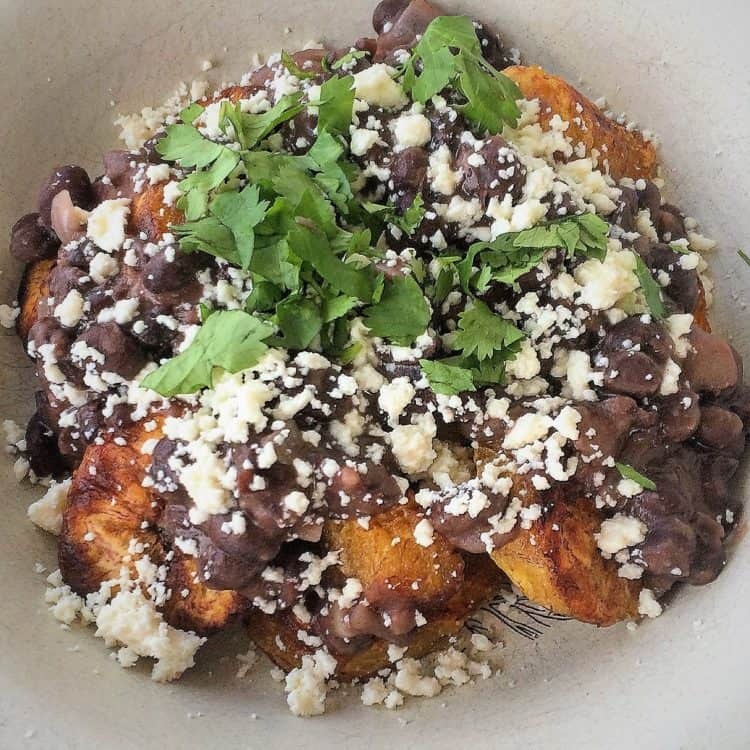 Sweet plantain topped with a creamy black bean sauce with squeaky melted cheese curds! What could be better? Preheat the oven to 375º. To prepare the plantain, slice off both tips, then make a vertical slit along the length of the plantain and peel. Slice into 1/4 inch slices at a 45 degree angle. Place on greased parchment paper on a baking sheet, brush with olive oil and salt lightly. 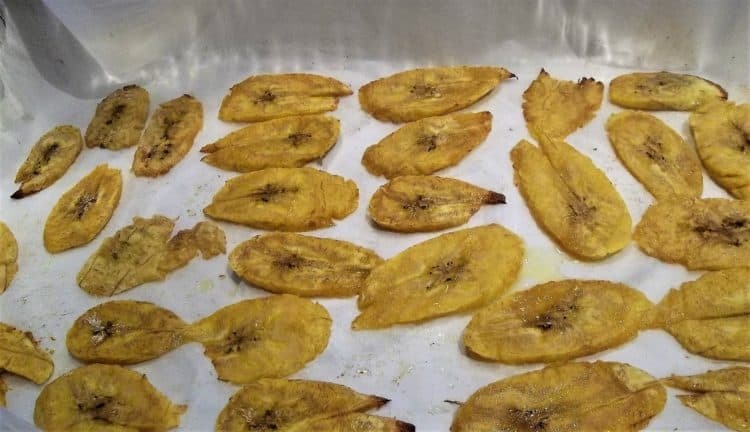 You may need 2 pans to fit all 4 plantain. Bake for approximately 10 minutes, then flip and continue to bake until golden and slightly crispy, about 10-15 minutes longer. To prepare the black bean sauce: in a large pan, heat the olive oil on medium heat and add the onion and garlic. Sauté 2-3 minutes until the onion is translucent. Add the black beans, cumin and 1/2 cup of water. Bring to a simmer, then lower the heat and cook with the lid on for about 20 minutes. Add salt and pepper to taste. Mash approximately half of the beans with the back of a wooden spoon for a creamier consistency. You are looking for a gravy like, yet lumpy texture. If the beans are dry, add a little more water. 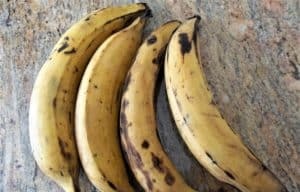 To assemble: divide the plantain slices amongst 4 bowls. Top with the black bean sauce, cheese curds (or queso fresco) and cilantro, evenly divided on each poutine. Serve immediately. I'll have to make this for the boys. They just live poutine and this is a much healthier version! I hope they enjoy it as much as my family did!